All these options are accessible either via File-->Open WIEN2k ... casade menu or via command line options. xcrysden --wien_struct filehead|file|directory Corresponding menu: File-->Open WIEN2k ...-->Open WIEN2k Struct File Reads struct file and renders the crystalline structure. xcrysden --wien_kpath directory Corresponding menu: File-->Open WIEN2k ...-->Select k-path Reads struct file and renders first Brillouin zone with special k-points. 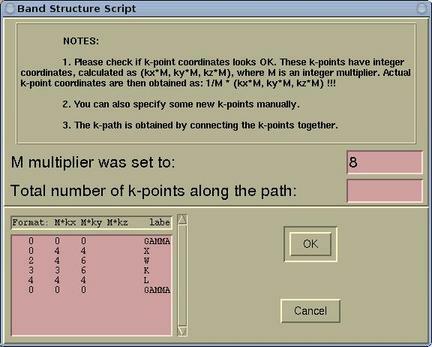 K-path can be selected interactively by mouse-clicking appropriate k-points. We must specify EMIN and EMAX parameters and total number of k-points along the path. This is merely an estimation of the total number of k-points, since XCrySDen tries to produce a uniform sampling of k-points along the k-path, therefore don't specify WIEN2k's maximum allowed number of k-points, as XCrySDen maight generate few points more. xcrysden --wien_renderdensity directory Corresponding menu: File-->Open WIEN2k ...-->Render pre-Calculated Density Reads struct, output5 and rho files and renders crystalline structure and precomputed charge density. 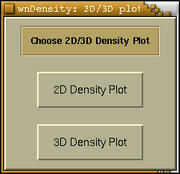 xcrysden --wien_density directory Corresponding menu: File-->Open WIEN2k ...-->Calculate & Render Density First, either 2D or 3D region for charge density calculation is chosen grahically by mouse-clicking. Then XCrySDen generates the in5 file(s), calculates and renders charge density. The density can be displayed either as isolines/colorplanes (2D) or an isosurface (3D). This option is available via File-->Open WIEN2k ...-->Select k-path menu or as --wien_struct command line option. There is nothing special for this option. 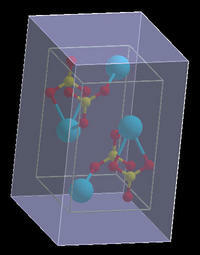 Displaying the crystal structure from WIEN struct file is alike displaying the structure from other supported formats. The decription of various available XCrySDen options for the visualization of crystal structures can be found in the following documents: Short Introduction to XCrySDen, Description of XCrySDen main window and menus, and HOWTO: Modify Menu. This option is available via File-->Open WIEN2k ...-->Select k-path menu or as xcrysden --wien_kpath directory command line option. 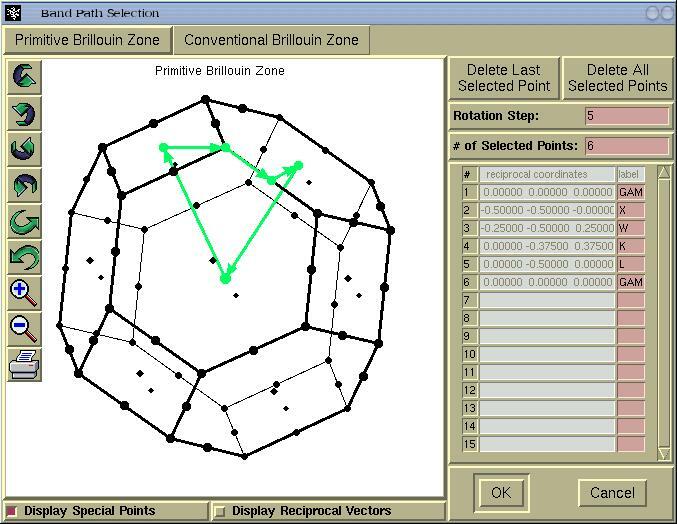 A special window pops-up where we select a k-path inside the Brillouin zone (BZ). Here we must specify the total number of k-points along the path. This is merely an estimation of the total number of k-points. The precise number of k-points is determined by XCrySDen in such a way that the density of k-points is as uniform as possible for all k-line segments. After pressing the [OK] button the file-browser will appear and we can save the .klist file for spaghetti plot. This option is available via the File-->Open WIEN2k ...-->Render pre-Calculated Density menu or as xcrysden --wien_renderdensity directory command line option. 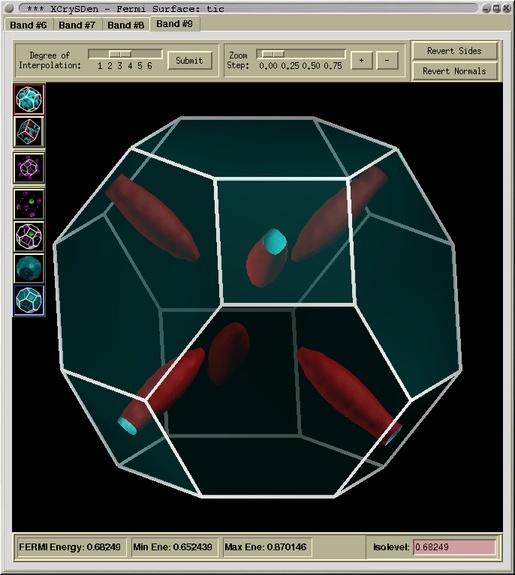 XCrySDen reads the struct, output5 and rho files and renders crystalline structure and precomputed charge density as contours or colorplane. Here you can read how to control various parameters for contour and colorplane display. Now we will have to select a region of space where the charge density will be calculated. Depending on our choice this will be either 2D or 3D region. Here you can read how to select a 2D region, and below you can read how to select a 3D region. The following window is devoted to the selection of the 3D region of space. Here is the description of widgets on above window. 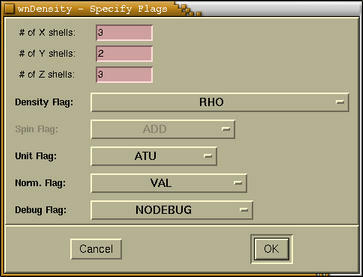 By default the space comprised by the whole unit cell is selected. Then we have the possibility to specify the margins. Here you can find the description about margins. Important: Only after we press the [Update button] the currently selected space will be rendered as transparent box. On the figure below we see the unit-cell space selection with the A=B=C=A*=B*=C*=0.2 margins. Submits the calculation to the WIEN program. But before that a special window pop-sup, where we specify various WIEN related flags. (Read more ...). The wollowing window is devoted to the selection of the 2D region of space. 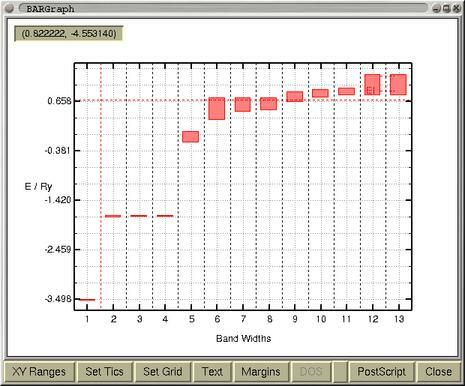 At the top of the window we specify the grid resolution and an interpolation setting. (Read more ...). 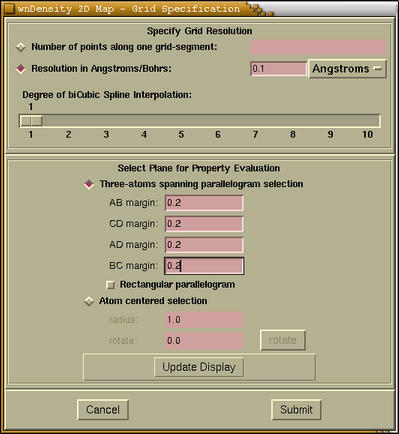 The second part (label Select Plane for Property Evaluation) of the 2D Map - Grid Specification window is devoted to the selection of 2D region of space. We can do that via two different procedures, which are chosen by pressing the corresponding radiobutton, that is either [Three-atoms spanning parallelogram selection] or [Atom centered selection]. Here you can find description of these graphical procedures. 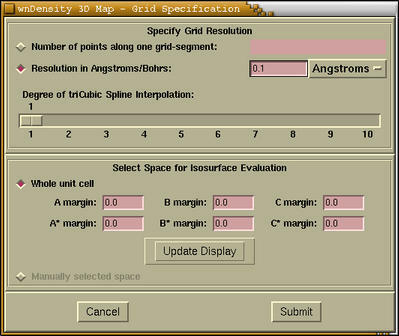 Two button are located at the bottom of 2D Map - Grid Specification window. The description of their function can be found here. These flags are the same for 2D and 3D charge density calculation, simply because the latter calculation in composed of several 2D slice calculation. For the meaning of this flags you should refer to WIEN manual. After we have done all above steps then the controlling window for either contour or isosurface display appears, depending on the 2D or 3D choice. Here you can find description for the contour display, and here for isosurface display. This is a new option and was not yet tested extensively, please be careful!!! 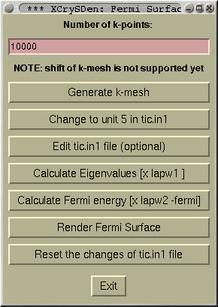 It is available via File-->Open WIEN2k ...-->Fermi Surface menu or as xcrysden --wien_fermisurface directory command line option. First a task window for Fermi surface creation Pops-up. The upper window displays the band-widths. The Fermi level is also indicated by red horizontal line at 0.66 Ry. 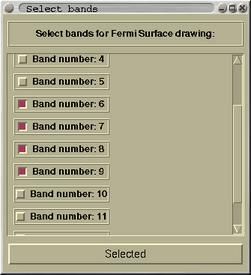 The purpose of the bottom window is the selection of the bands for which the corresponding part of Fermi surface will be drawn. Usually, one selects the bands that cross the Fermi level. When the bands are selected proceed by pressing the button [Selected]. In a while the Fermi surface of the first selected band will be displayed in a viewer window. Actually, the viewer is composed from notebook, holding the Fermi surfaces of all the bands in separate pages.